The mostly vacant Arthur Ross Gallery functions as a vitrine displaying Henrique Oliveira’s specimen Adenocalcinoma Poliresidual, which hangs pendulously opposite the room’s pointy Gothic windows. It is an enormous work, entirely occupying its own wall. Normally for Oliveira this would only be the prelude, leading onward to an immersive installation of cavernous, human-like orifices that viewers may penetrate and explore. Such is not the case here, allowing the opportunity to fixate on this solitary and somewhat forlorn sculpture. 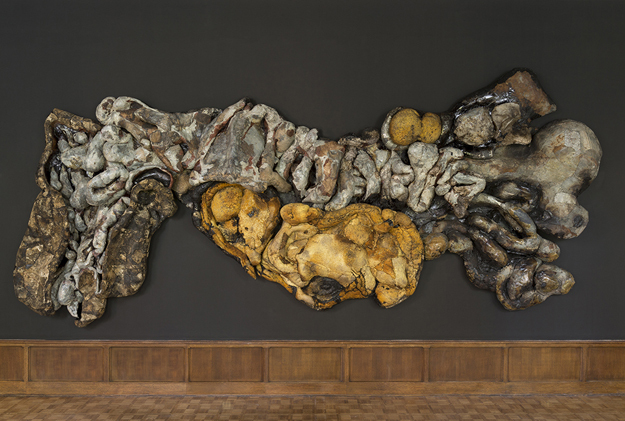 Perhaps a less enthralling aspect of Adenocalcinoma Poliresidual is what the viewer may find it to resemble—bulbous bits of diseased or decaying bone, viscera, muscle tissue, and fat—all at a gigantic scale. At the Q&A and reception following the artist lecture, there was the predictable “it looks like a tumor” and “have you been to the Mütter Museum yet?” chatter. Oliveira acknowledged his use of medical illustrations and that he found the gallery setting, housed inside the Frank Furness-designed Fisher Fine Arts Library, more befitting of a natural history museum. One may also be reminded of Philadelphia’s (and Penn’s) place in the development of modern medicine, and how that history has intersected with art, most notably in Thomas Eakins’s The Gross Clinic and The Agnew Clinic. The work itself is an imagined amalgam, not an anatomically correct model, abstracting the sum of its parts. Oliveira eloquently unpacks the work’s chimera of a title in a video on the ARG website. Still, in spite of being a hulking mass, it invites detailed examination and dissection (with the eyes, of course). There are darkened, scorched crevices that demand inspection and flaps that one might wish to lift with a pair of forceps, giving rise to amateur haruspicy. 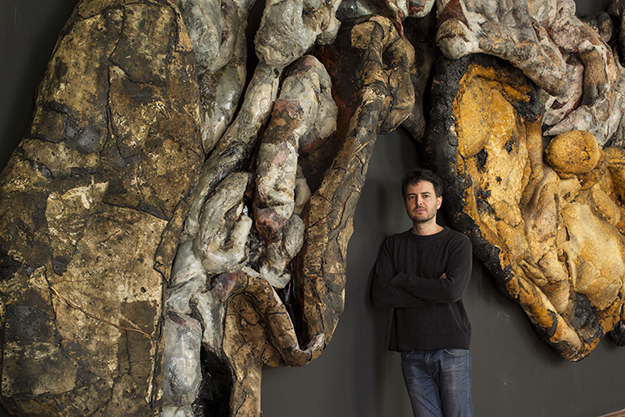 What is most interesting about the work, and Oliveira’s general practice, is his sourcing and use of materials, often recycling cast-off scraps. Others have remarked that his modus operandi mimics the poverty-necessitated salvage and improvisation prevalent in building construction in Brazilian favelas (slums). One dares to dream what he might have done if given a residency at RAIR Philly and a grand space in which to erect one of these installations. With reference to the particular work in discussion, Oliveira does not attempt to conceal the man-made provenance of his materials. Seams, staples, and other fasteners are all thoroughly visible, seemingly serving more of a practical purpose rather than an aesthetic one. A bolted-together monstrosity results, begot of human hubris, instead of a benevolently created pseudo-organic form that has started to putrefy. Adenocalcinoma Poliresidual is an interloper in the natural history museum paradigm, a forgery that cannot pass for biological—yet one with the ability to induce the kind of pity owed to Dr. Frankenstein’s tragic creature.